Although Amarna is a ‘one-period’ site, the main areas of occupation often have a surprisingly complicated stratigraphy, representing both changes of use during the Amarna Period and the ‘events’ – the collapse of walls, the accumulation of sand, the digging of holes by animals and humans – that transformed the ancient city into the archaeological site that we see today. When excavated, the site also produces an abundance of finds. Much of it is relatively commonplace, but since one aim of modern archaeology is to seek patterns in all kinds of evidence, it is needful to make as careful and complete a record as possible. The decision to excavate is not therefore taken lightly. Between 2002 and 2005 a small area of housing in the Main City was investigated during four seasons of excavation. The project had two components. One of these was the house of an ‘official’, a chariot-officer named Ranefer (house N49.18). This had been examined in 1921 by the Egypt Exploration Fund and an account published shortly afterwards. The house was unusual in having been built over the foundations of an earlier and smaller house, only a small part of which was uncovered in 1921. The aim of re-opening the excavation again was to investigate the earlier house more extensively, and to provide soil samples from under the floors of the later house for study by the environmental specialists of the Project. The other component was an area of small houses (named Grid 12) that lay not far away and had escaped the extensive excavations of the early twentieth century. Fragments from a range of craft activities and from other aspects of the occupants’ lives attest the variety of experience of a segment of the population that must have been relatively poor. The excavation is currently suspended to allow time for writing up the results. 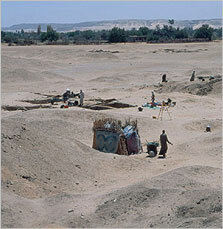 As a complement to this study of the urban poor at Amarna a modest excavation programme has been begun at one of several cemeteries of the Amarna Period discovered in recent years that seem to have held the burials of poorer people. The particular cemetery chosen (Grid 14) lies close to the South Tombs. The first season of excavation was in 2006, but prior to that (in 2005) a surface collection was made of human bones and of potsherds washed out of the cemetery by flash floods. The number of artefacts so far recovered is modest (a full listing is given in Excavation/South Tombs Cemetery); particular interest attaches to the bones. They derive from people alive at more or less the same time (some could have been neighbours) and are thus a fragment of an actual city population. Preliminary indications are that they lived hard short lives. A small proportion of Amarna’s inhabitants lived in special-purpose isolated settlements. One of these, the Eastern Village or Workmen’s Village, was investigated in 1921/2 and again between 1979 and 1986, and proved to be rich in information on how people adapted to their circumstances. A second such settlement, the Stone Village (even more isolated) is now being studied for the first time (beginning in December 2005). As in the case of the house of Ranefer, the re-examination of the sites of older excavations can provide valuable fresh evidence. In 2012, the re-examination began of the Great Aten Temple, the subject of a major excavation in the 1930s. It is being done in conjunction with a plan to protect the site better and to render it more intelligible to visitors. See Recent projects > Great Aten Temple. It is useful when excavating a site and recording information from it to create a grid of squares individually labelled. The following grids have so far been used at Amarna since 1979. In each case the squares are of 5 metres. They are aligned, as far as possible, according to local topography rather than to compass points. In the Main City these grids do not replace the 200-metre grid system created by the Borchardt DOG expedition, which remains useful as the basis for numbering individual houses though not for the organization of an excavation.